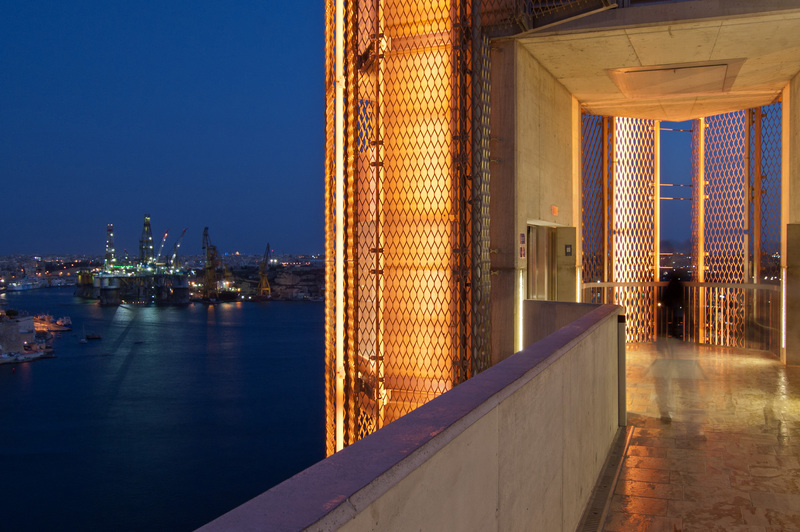 This twenty-storey high panoramic lift, commissioned by the Grand Harbour Regeneration Corporation plc and designed by AP Valletta, is located on the edge of Malta’s historic fortified capital city of Valletta. Where once the 16th century fortified walls of the town served to keep enemy ships at bay, they are now under conservation order and provide an unbeatable new access for visitors and residents flocking here. 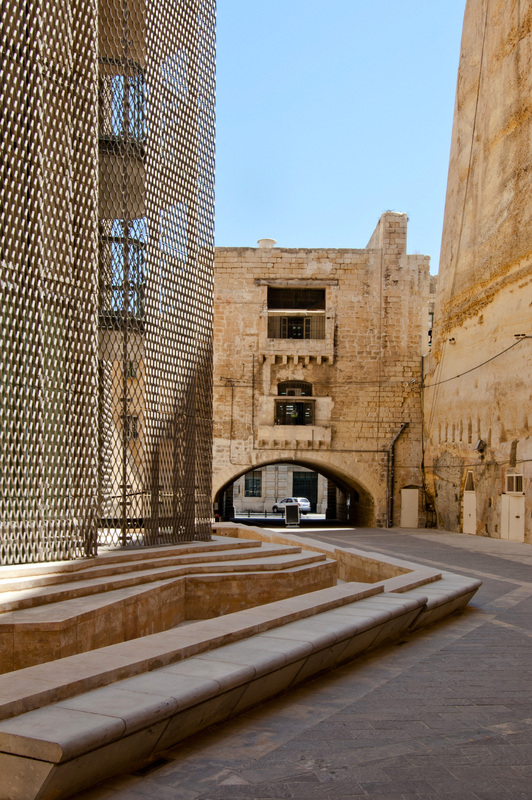 The structure is designed to enhance movement of large numbers of visitors and residents between the Grand Harbour and Valletta, from the water’s edge along the Valletta waterfront, over the powerful landward enceinte of fortifications and into the heart of the city, creating new links to the Upper Barrakka Gardens and the new City Gate. 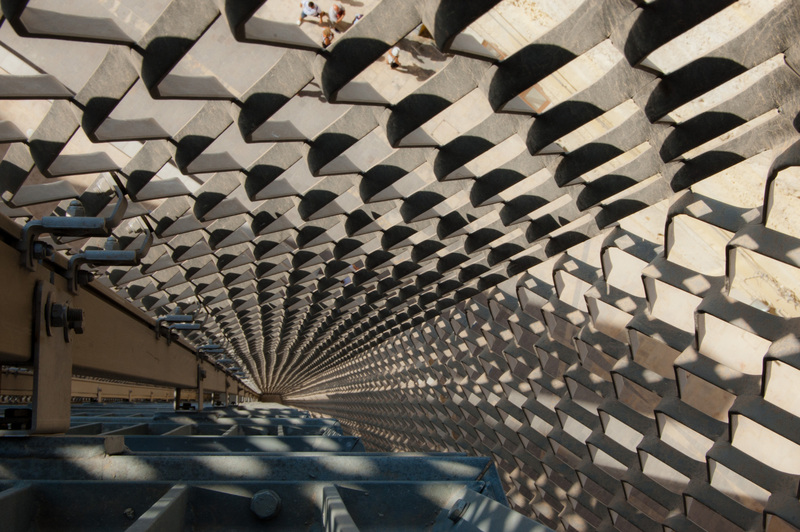 It is bound to leave a significant visual impact on this sensitive heritage site and leaves no room for compromises on the engineering level, where attachment to the historic walls was not possible and where the programme was extremely onerous. 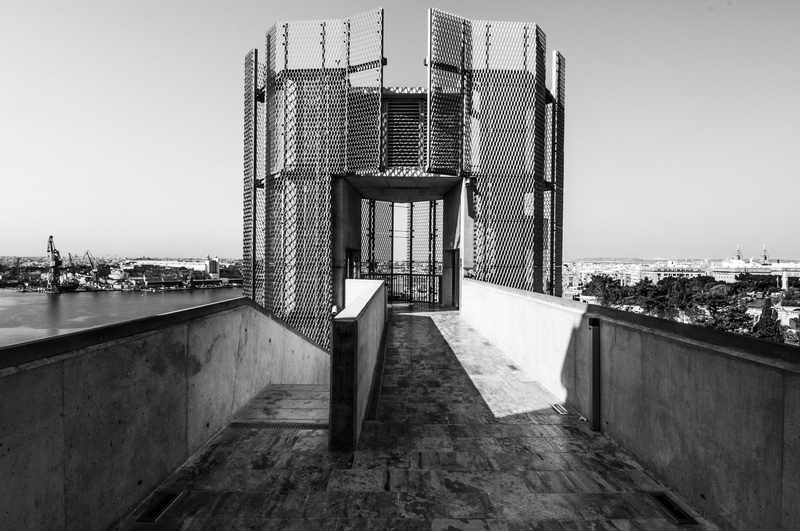 The Barrakka Lift project therefore required a certain rigour to resolve the dichotomy between the strong historic nature of the site and the demands for better access placed upon it by cultural and economic considerations. 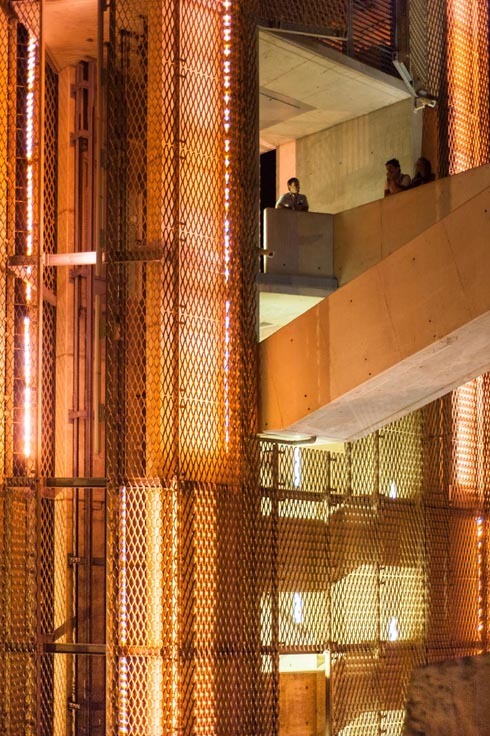 Shifting political and economic realities have always been a challenge for this world heritage city and the connection between harbour and city has transformed itself over the years in response to these unremitting changes. The 18th century saw the development of harbour infrastructure that gave rise to a thriving commercial hub outside the walls, separated from the residential heart of the city, while the British period transformed the port into a vital strategic naval and merchant base in the Mediterranean. Today, a very different economic reality is once again dictating the transformation of this dynamic area of the town: the recent restoration of Baroque waterside warehouses into a thriving cruise ship terminal as well as the development of restaurants and cafes, prompted the re-activation of a lift that had been built to connect the harbour with the town in 1905 during Valletta’s heyday as a trading port. 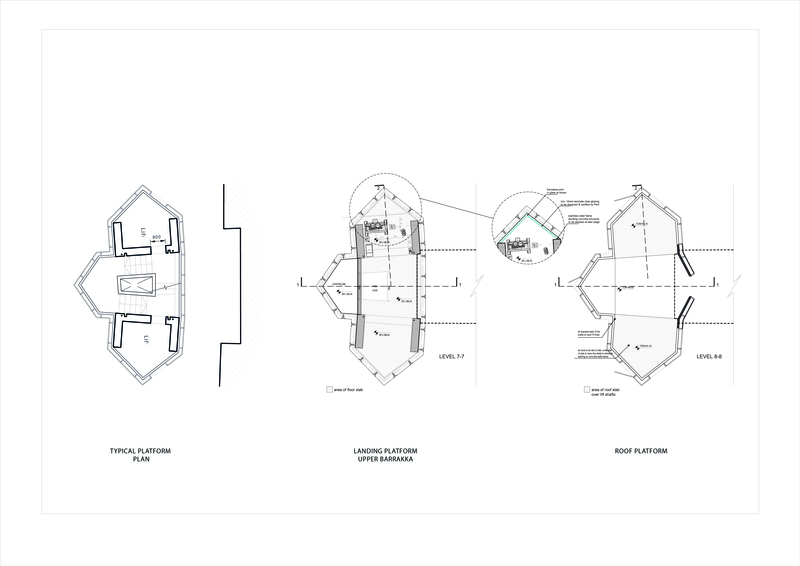 The original lift structure was 60m tall and contained two lift cabins each with a capacity of twelve passengers. The operation was closed down in 1973 and the structure abandoned and eventually dismantled by the 1980s. The renewed connection serves the needs of thousands of visitors approaching the city from the traditional arrival point at the foot of the bastions. 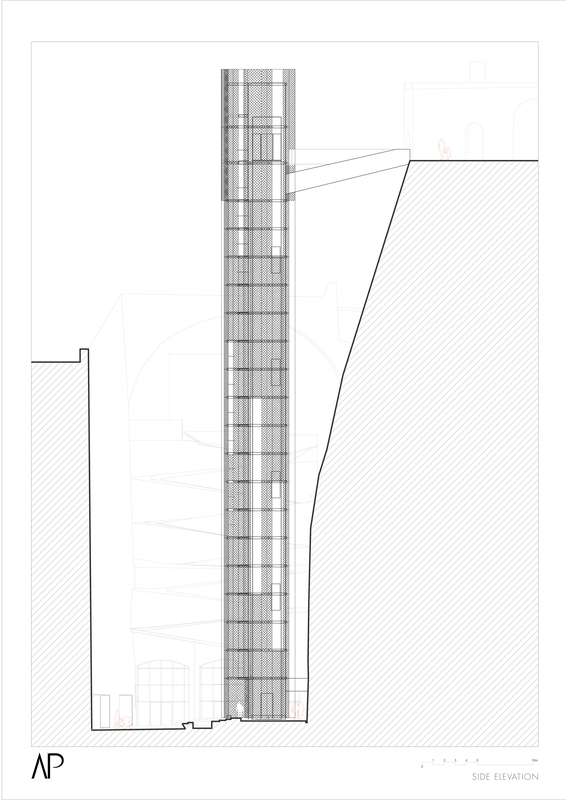 The heavy demands of accessibility to and mobility around the town required a much larger footprint and a stronger vertical statement within the skyline of the historic harbour were therefore inevitable. 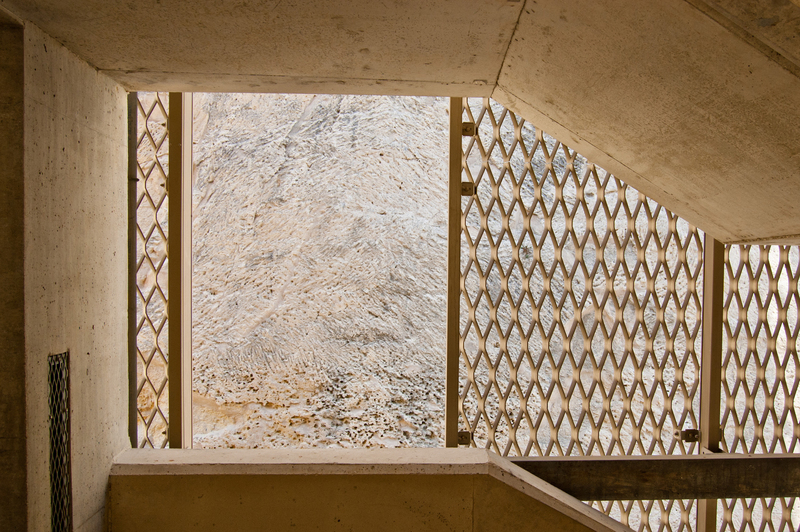 In order to resolve this, a cavity was created by pulling the two lifts apart, where a staircase could be threaded in between. 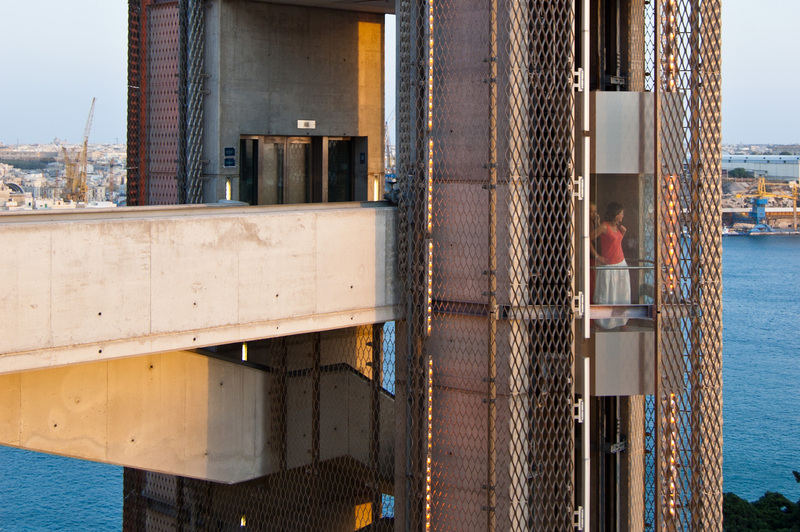 Not only does this space accommodate mandatory safety requirements, but it also reduces the visual weight of the lift structure itself and accentuates the vertical proportions of the structure.